Date of 2015 London-Brighton Commercial Run ? : On May ?th. Our (NZ) correspondent Mark, and his oppo Tim, have found a fascinating source of ancient photos / old postcards of old cars on an Italian Ebay website, for sale by interposter. "None of the photos were identified so great chance for sending to the SVVS Help Pages for ID when time permits". -- This is one of two photos of the same vehicle, 700 photos apart. Not many cars had side radiator panels and this is a rare one, a French cca 1901 Corre Voiturette using a De Dion engine. Another fascinating photograph from our regular contributor Cicos Florin in Constanta by the Black Sea (Romania) who is interested in old cars of Romania. Do we know what this is? -- Photo is titled 'Le Rapide du Lucbon Bains, Busteni, Aout 1909". Not an easy one at all and the only answer came from our Ariejan Boss in Holland. He thinks Le Rapide is a cca 1906 Alcyon 7HP Two-seater Voiturette having a single cylinder 950cc engine. Started 1890 with bicycles, 1902 motorcycles, cars 1906. Our (NZ) correspondent Mark, and his oppo Tim, have found a fascinating source of ancient photos / old postcards of old cars on an Italian Ebay website, for sale by interposter. "None of the photos were identified so great chance for sending to the SVVS Help Pages for ID when time permits". -- Unusual German car built by A Ruppe & Sohn, Apolda, which has an encased fan to keep the air cooled V2 engine working. Extended runningboard so is a cca 1906 Piccolo 5hp Vis-a-Vis. Lovely photo received from our regular correspondent Mark (New Zealand) of a car he thought might be a Metallurgique of about 1906. -- Not an easy one but doubtful on Metallurgique. Metallurgique were Belgian and by 1906 they had the distinctive V radiator. One of our sages did some research and determined that this is a Swiss cca 1906 Martini 20'24 Roi-des-Belges Double Phaeton. Export markets included France, England, Russia, North/South America, New Zealand and Egypt. 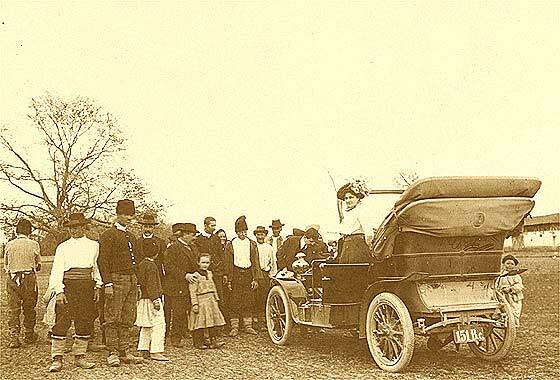 Lovely photo received from our regular correspondent Mark (New Zealand) of a car he thought might be Talbot of 1906. -- Definitely a Talbot from the catches holding the bonnet sides but concerned by number of hubnuts on front wheel as to model type. 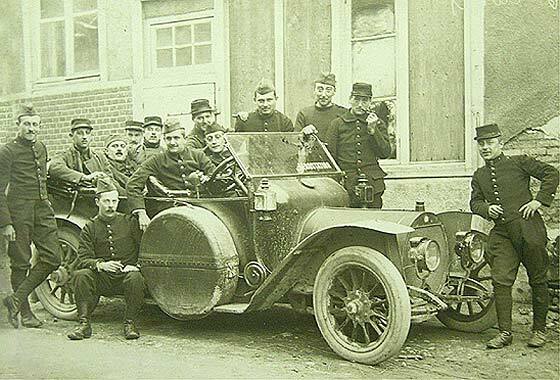 One of the bigger ones so probably a cca 1907 Talbot 20'24 Roi-de-Belges Tourer. Imported Clement Talbots but made in Kensington London England from 1906. Became STD, then Rootes, then Chrysler, then Peugeot - Citroen. Another fascinating photograph from our regular contributor Cicos Florin in Constanta by the Black Sea (Romania) who is interested in old cars of Romania. Do we know what this is? -- Photo is titled 'G hergani, 4 Avril, 1910" with local villagers in national costume. Lovely photo. A number of cars had a transverse rear spring including the French De Dion Bouton. 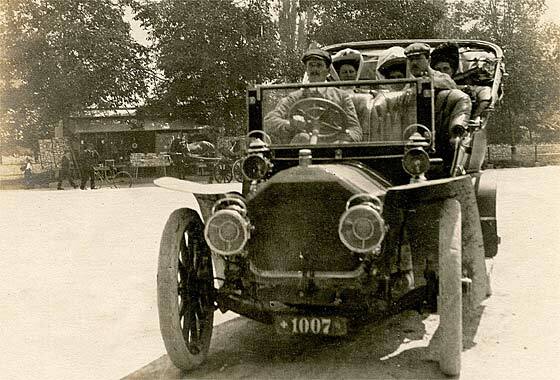 Our Ariejan Boss in Holland thinks this is indeed a cca 1908 De Dion-Bouton Double Phaeton. Could be 12'14HP model. Another fascinating photograph from our regular contributor Cicos Florin in Constanta by the Black Sea (Romania) who is interested in old cars of Romania. Do we know what this is? -- This is a French car made in Suresnes, Paris by Alexandre Darracq who started with Gladiator bycicles in 1891 which he sold to Clement. 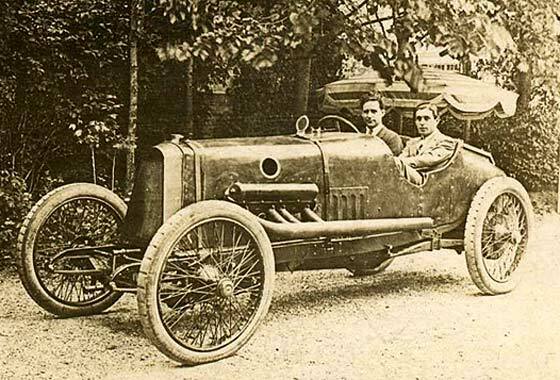 Darracq gave birth to Talbot in the UK and to Alfa Romeo in Italy and was third largest French car maker. This is a cca 1908 Darracq Model RR Double Phaeton. Puzzling interesting photo received from David Skilton (UK) saying the photo is from c. 1912, taken in the UK, possibly Warwickshire. 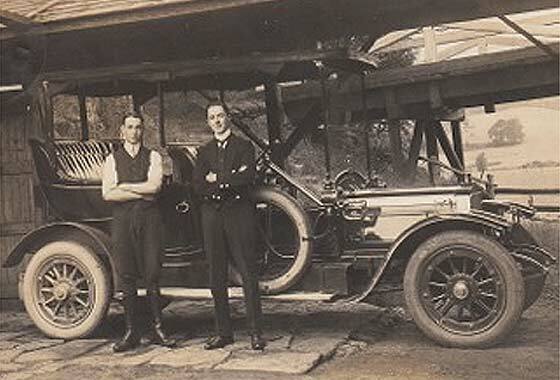 The chap on the right, infull uniform, his grandfather, Harold David Skilton (1893-1965), then working as a chauffeur. -- Two of our wise sages think this is a 6 cyl Talbot and many features do indeed suggest it is. My primary doubt is there seems to be a hump on the top of the bonnet a la Brasier or Pipe. Sages think it is a reflection of overhead spars. Dunno? Our (NZ) correspondent Mark, and his oppo Tim, have found a fascinating source of ancient photos / old postcards of old cars on an Italian Ebay website, for sale by interposter. "None of the photos were identified so great chance for sending to the SVVS Help Pages for ID when time permits". -- A Pilain that is not a Rolland-Pilain. 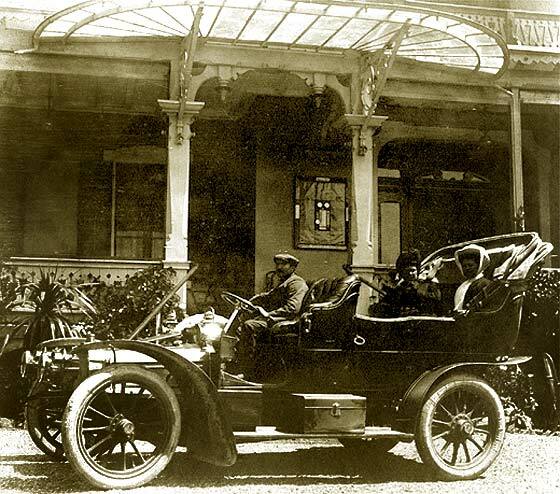 Francois Pilain built cars in Lyon (S.A.P. :1901 to 1920) while nephew in Tours (RP), no connection. Scuttle says this is a cca 1909 Pilain Type 4 Tourer. 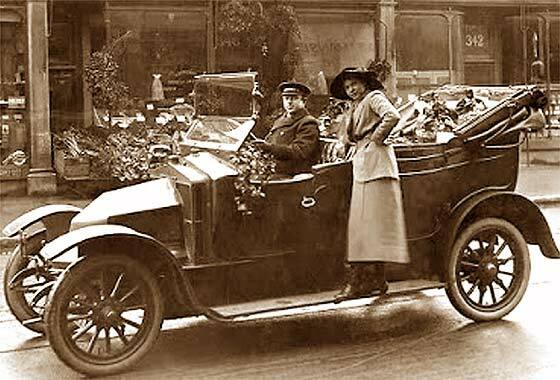 Link received from our regular correspondent Mark (New Zealand) of a photograph on the NZ website transpress showing 'a car in England 1915'. Mark said he thought it was a Siddeley Deasy but was not sure of the model. -- Not a Siddeley Deasy but the earlier cca 1910 Deasy JDS Torpedo Phaeton. Identification feature is the bonnet without swaging and panels. 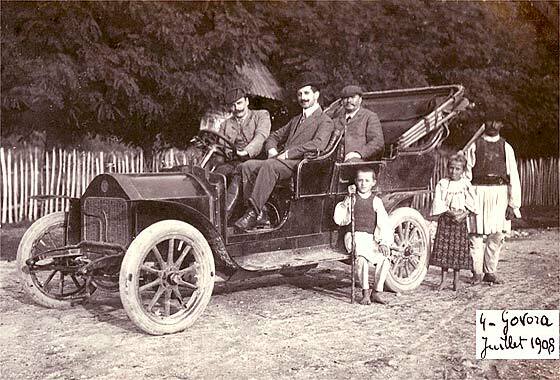 Deasy Cars started in 1906. 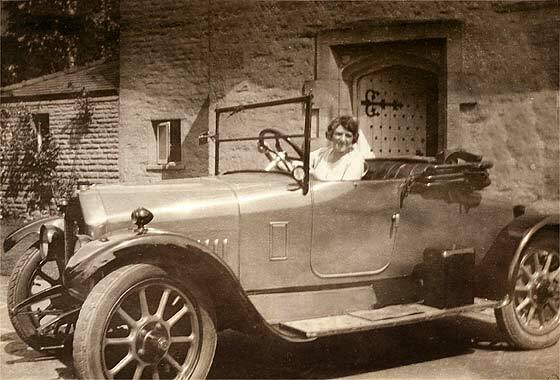 Deasy left in 1908, replaced by John Siddeley, previously of Siddeley Cars, Wolseley, hence re-name. Lovely photo submitted by Andrew Moore of Linconshire (UK) relating to a series of handwritten books by an unnamed author JHD about his travels from Tilbury to Calcutta and back on tea clipper SS Manipur. Car in photo belonged to captain's uncle. 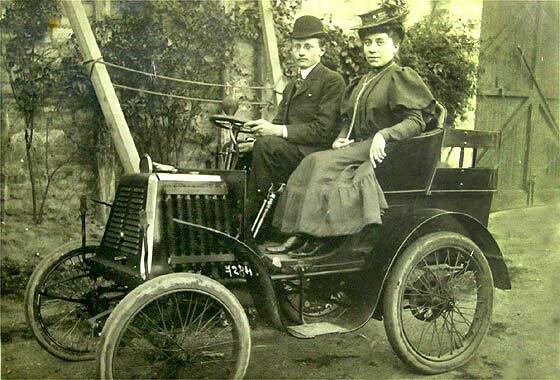 -- This car was made in Clayton, Manchester, by Marshall & Co who started in bicycles and went into cars in 1897 with car similar to Hurtu. 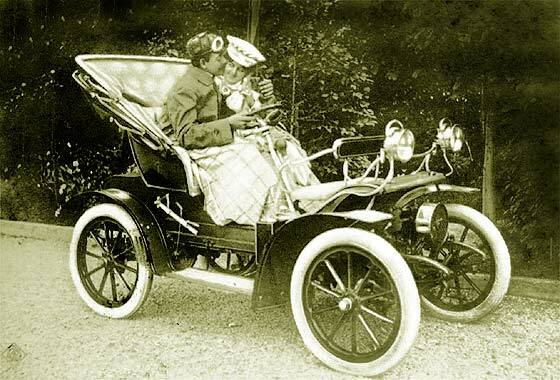 In 1901 named car after factory. Major maker gone by 1925. Seems a cca 1912 Belsize 10'12 Two-seater. 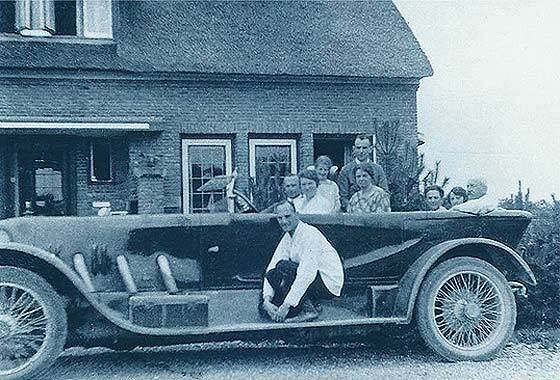 Another puzzling photo posted on the AACA website, this by Jaap Bruynzeel (Holland), saying this is a photo taken in June 1921, some 50 km from Amsterdam - Holland. He assumes this car is European but it might be American? -- Imposing expensive car which would have been coachbuilt with a powerful engine. We therefore think this is probably a cca 1920'1 Joswin 28'95 Tourer made in Berlin Germany generally having Szawe bodies /Mercedes engines. Joswin were made 1920 to 23 . Another fascinating photograph from our regular contributor Cicos Florin in Constanta by the Black Sea (Romania) who is interested in old cars of Romania. Do we know what this is? -- This is an Italian car made in Turin by the Fabrica Italiana Automobili Torino. 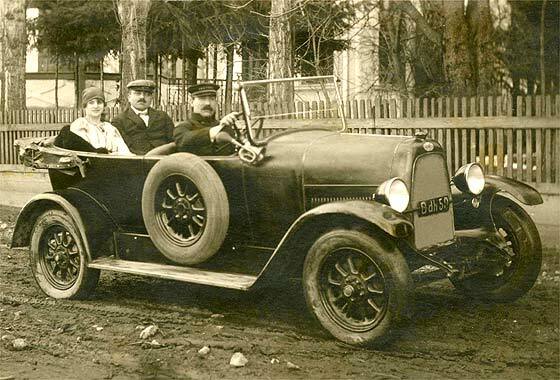 The shape of the logo on the radiator surround suggests this car could not have been made later than 1921, however. 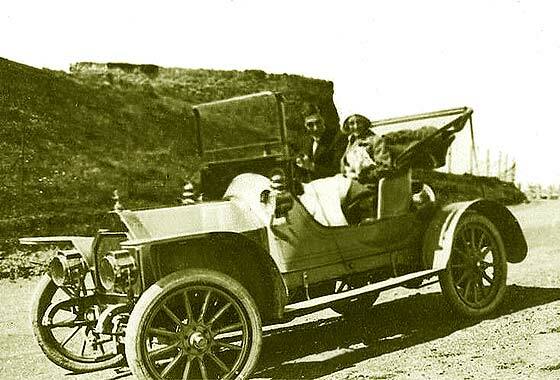 It seems to have front brakes which suggests it may have been; appears to be a cca 1921 FIAT 501 Torpedo. 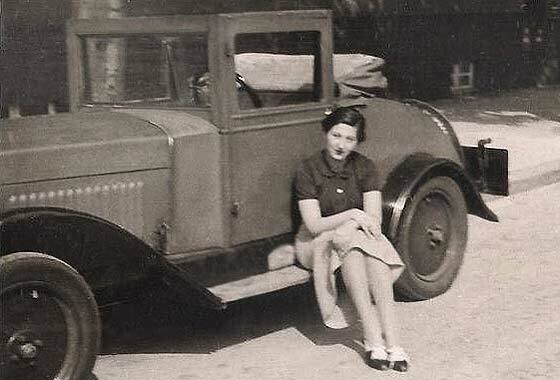 Photo sent in by Richard Sager (UK) saying simply: "Wonder if you could help identify my grandmother's car in attached pic taken in lancashire ?" -- Immediate thought was Humber but the rad around the badge area was sloping like Peugeot. Out Humber expert Tony Oakes advised indeed a Humber. Not so easy to determine the exact model, but probably a cca 1921/24 Humber 11.4 HP Two-seater. Sidelight type and no dumbirons bar suggested probably not the later 12/25HP. 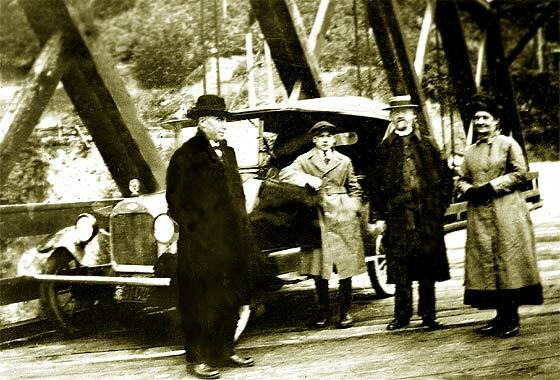 A rather damaged photo received from Tom from (Canada) saying: "Here is an old photo taken in the Vancouver area about 1920 or so. Can you identify the car? I think it might be a Bentley. Thank would be great! -- We have repaired and tinted the photo and can advise that regretfully it is not a Bentley, nor is it British. American car possibly built in Canada by the McLaughlin/GM of Canada factory in Oshawa. Bumper bar, so this would seem to be a cca 1921 Chevrolet 490 Touring. 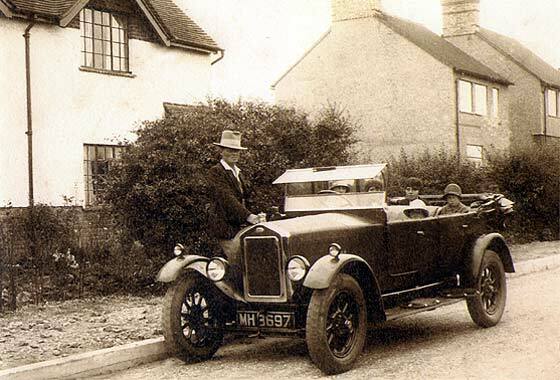 Photo sent to us by David Montgomery (UK) saying: " The attached photo shows my maternal grandfather standing proudly next to what I believe was the first car he owned. It would have been taken around 1930. My mother, now 96, is sitting in the middle rear. I've done a bit of research and have eliminated most of the common makes." -- MH 8697 is a Middlesex County Council registration issued 7'24 to 8'25, no front brakes, so this would be a cca 1924 Wolseley 11'22 Four-seat Tourer. 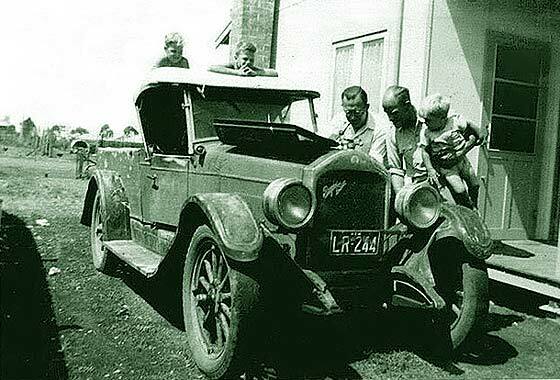 An interesting photo received from Terry Walls (UK) saying the photo was taken in the early 1950s in NSW Australia. He has been trawling the web. Hudson and Essex 'Super Six' models don't appear to match radiator shape. -- Mark Dawber advises American car made by William Crapo Durrant after leaving GM in 1921 and starting Durant Motors making the Star car. Export models could not use Star name in the Commonwealth because of UK Star, so this is cca1926 Rugby Six Pickup. Another interesting photo via Iñigo Agirre (Spain) from a Facebook group devoted to history of San Sebastian Desaparecida in Spain. Could we advise make of vehicle? This one is Kutxateka /Foto Car/Ricardo Martin. 1927. -- This type of racing car body is called a 'tank' and a number of manufacturers in the early 1920s made one. Initially thought Bugatti 32 but one of our experts suggests it is one of two French 1927 Bignan, effectively EHP with blown Bignan engine, 112 mph. Gone 1931. Another photograph received from Georges Truffaut (Belgium) from postcards which he is trying to identify. Photographed probably in France, this is believed to be an Austin. -- Wheels are Austin type but Austin Sevens were also made by BMW, Bantham and Rosengart. 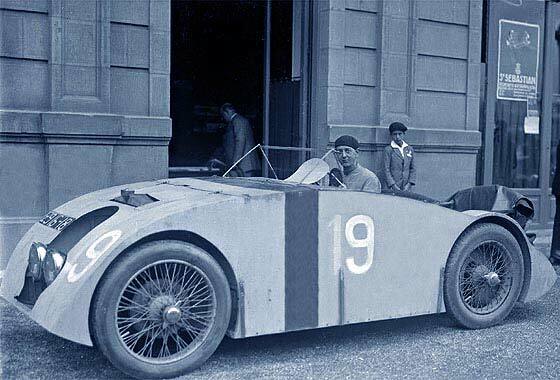 Our Sevens specialist John Caddy has determined that a very similar car was manufactured by Rosengart Paris as a cca 1929 Rosengart LR2 Aerodynamic Sports, 748cc, so this could be variant or a copied special. Link received from our regular correspondent Mark (New Zealand) of a photograph on the AACA website posted by mikethecat wondering if it was an Essex. -- The car does have an American look. Essex was a division of the Hudson Motor Co of Detroit, but the car is neither the Essex nor Hudson. This is a car manufactured in Germany and is a cca 1930 Opel 4'20 Cabriolet similar to previous on these pages. 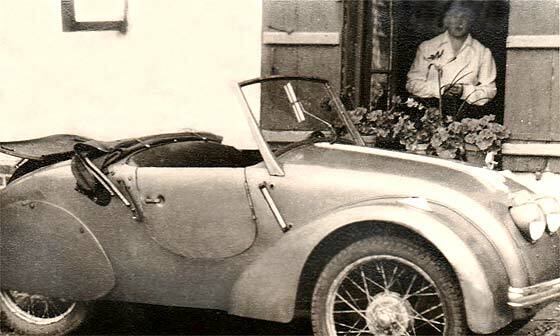 4'20 was last development of the 4 PS Laubfrosch 4'12, copy of the Citroen 5CV. 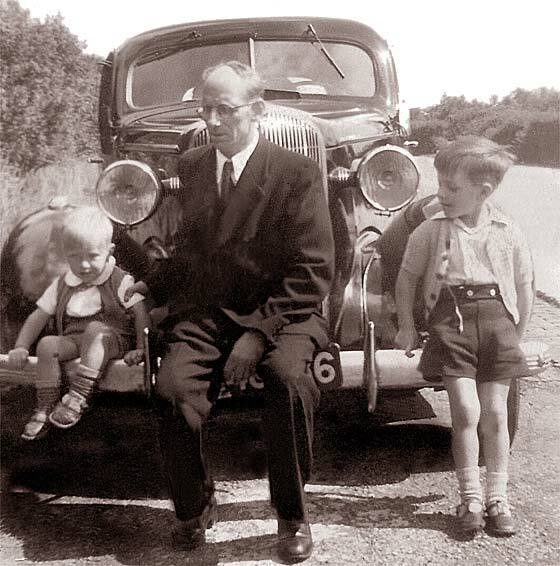 Lovely photo submitted by Robert Hoppel of Texas (USA) of his grandfather with him (right) and brother (left) somewhere along the road in Holland (where they lived). -- This one took a bit of time and remains partially puzzling. Everybody including our friends at the AACA in the US agree this is a cca 1936 Buick Sedan except for the fact that nobody can find one with downfacing wipers from the roof. Suggestions of a Mc Lauglin Buick or a European made Buick did not resolve problem! 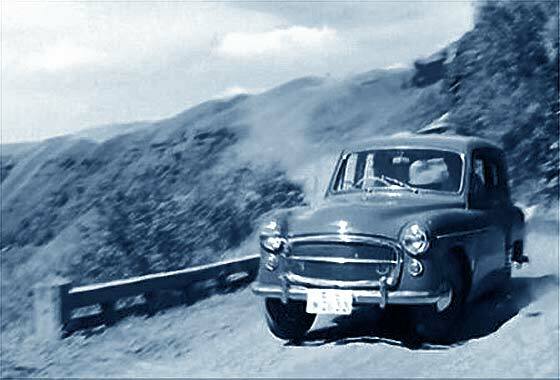 Cinema screen grab taken from a classic Japanese film 'Harikomi' (Stakeout) made in 1958, where cars are being investigated by IMCDB. Story involves a couple of policemen watching a woman from a hot and dingy hotel room and who may be the ex-lover of a murder suspect. -- This car is not at first sight what it may seem. Looks very British but is actually a car made in Japan by Isuzu Mototors under licence from Rootes Group UK being cca1955 Isuzu Hillman Minx Saloon. Lovely photo submitted by Anikka Fuchs (Germany) who is rapidly becoming keen on old cars via her boyfriend. Currently working in France, she snapped this interesting collectors piece in the streets of Salies de Béarn. What is it? 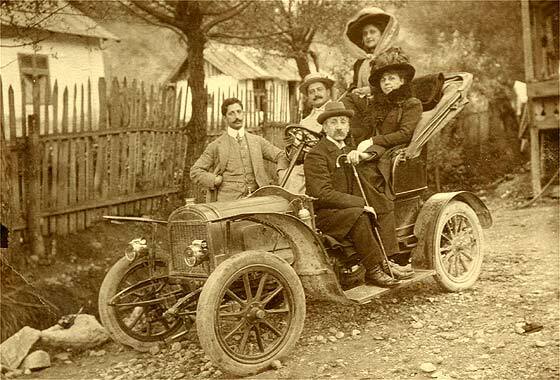 -- French car made by one of the world's oldest auto manufacturers making engines in 1876. 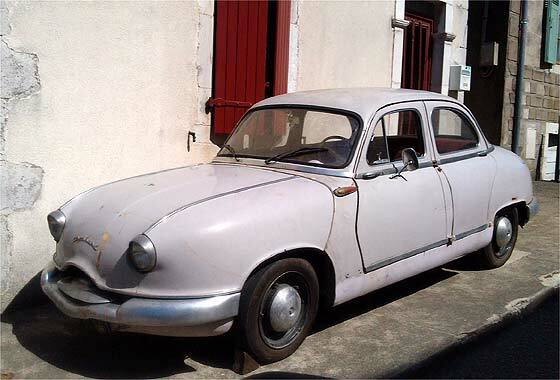 Has quaterlights so is probably a cca 1956 Panhard Dyna Z5 Luxe. Some Luxe cars and all to USA did not have the central foglight. Became Citroen and now Renault. Another interesting photo via Iñigo Agirre (Spain) from a Facebook group devoted to history of San Sebastian Desaparecida in Spain. Could we advise make of vehicle? This one is Kutxateka /Fondo Foto Car/Ricardo Martin; A truck of the city cleaning service. San Sebastian 1915. -- Similar bonnets were used by European Manufacturers including Benz Gagenau. Unusually large and ribbed wheelhubs do not seem to be common to the usual makes of trucks of the period. HELP ! Another fascinating photograph from our regular contributor Cicos Florin in Constanta by the Black Sea (Romania) who is interested in old cars of Romania. Do we know what this is? -- Our wise sages have scratched heads over this one and apart from agreeing this is cca 1920s Hispano Suiza Aero Engined Special, have not been able to nail it any more precisely. Likely a one off. 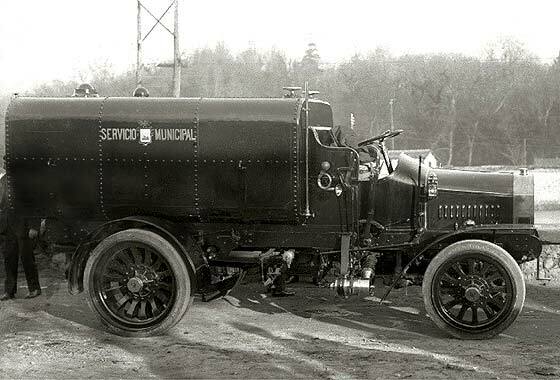 A number of specials were built from redundant WW1 Hispano HS8A V8 11.8L engines. Wolseley had licence.